Flames from the deadly Camp Fire won't reach California's Bay Area, but that doesn't mean it's not still wreaking havoc on the region. Smoke from the Northern California fire is leading to record-high levels of air pollution. Masks have become the fashion statement du jour in San Francisco the past few days. The air quality index in San Francisco rose to 258 at noon Friday, a reading which qualifies as "very unhealthy." That reading had only sunk to 209 by 9 p.m. local time on Friday. Meanwhile, across the Bay, in Oakland, the air quality index was 248 Friday night -- also in the "very unhealthy" range. Jenny Shao, a graduate student in San Francisco, dons a mask Friday, Nov. 16, 2018, to protect from the city's poor air quality due to the Camp Fire. Officials warned that once the index reaches "very unhealthy," everyone is susceptible to experiencing trouble breathing or coughing and sensitive groups, like those with asthma, may experience even more serious issues. Sacramento, California's capital city, reached a "hazardous" level of 332 at noon on Friday. For Chico, the region where the Camp Fire continues to burn, the air quality index was an astronomical 450 on Friday night. The air quality in San Francisco was the worst the region has ever experienced, according to Berkeley Earth, and breathing in air outside all day on Friday was the equivalent of smoking 11 cigarettes. 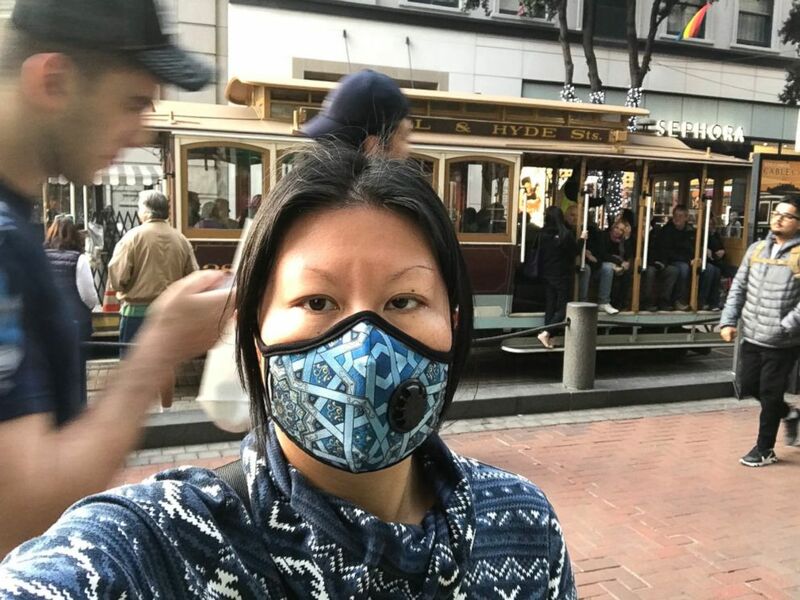 San Francisco Department of Emergency Management advised people to stay indoors if possible and wear special masks designed to filter the polluted air. The California Department of Public Health shared information on specific masks to wear. The annual meeting between Cal and Stanford football, known as The Big Game, was postponed from Saturday until Dec. 1 due to the air quality. The game was to be held in Berkeley, on the University of California campus. "Our primary factors in making the decision to postpone the game were centered around the health and safety of our student-athletes, fans and everyone involved in putting on the game," Cal football coach Justin Wilcox said in a statement. The Camp Fire has burned through 146,000 acres in Northern California and remains just 50 percent contained. The fire burned most of the city of Paradise to the ground and has claimed the lives of at least 71 people. President Donald Trump was set to visit the area Saturday. ABC News' David Herndon contributed to this report.